The Joseph Experience showcases their premium award winning wines and olive oils in one delicious offering. In this sit down tasting, you’ll be treated to a collection of wines from their Joseph range as well as a local platter featuring their olive oil, local bread and Italian cheese – the ultimate way to experience this exceptional winery (pictured above). Tour their new Biodynamic Hut, believed to be the only one of its kind in South Australia. The hut allows visitors to go behind the scenes as part of their vineyard tour and learn first hand how biodynamic viticultural practices are implemented at Gemtree Wines. The hut features local and recycled materials, further supporting their sustainability approach. Explore the vineyards, wetlands ecotrail and return to the cellar door for a tasting. Explore your creative side and blend your own wine to take home. There are also masterclasses and degustation options available. If it is all about the views, make sure you visit the top floor of the recently opened d’Arenberg Cube. With a $10 entry fee, your standard wine tasting experience is included, or you can upgrade to one of their premium flights at a reserved tasting area on the top floor. Offering eight behind the scenes tours including the Church Block Blending Class and Trott’s Tales where Trott’s stories come to life over a wine tasting in his cellar. To complete the experience, don’t forget to check out Harry’s Deli where platters and casual food are a specialty. With a specially designed tasting room, Bekkers offers an affordable wine flight showcasing their premium wines, providing unique insights into the world-class McLaren Vale Wine Region. This is matched with stunning views from the modern, glass-frontage cellar door. The ‘Icon Tasting Experience’ guides you through their flagship red wines, matched with a local platter in their iconic 150 year old chapel. 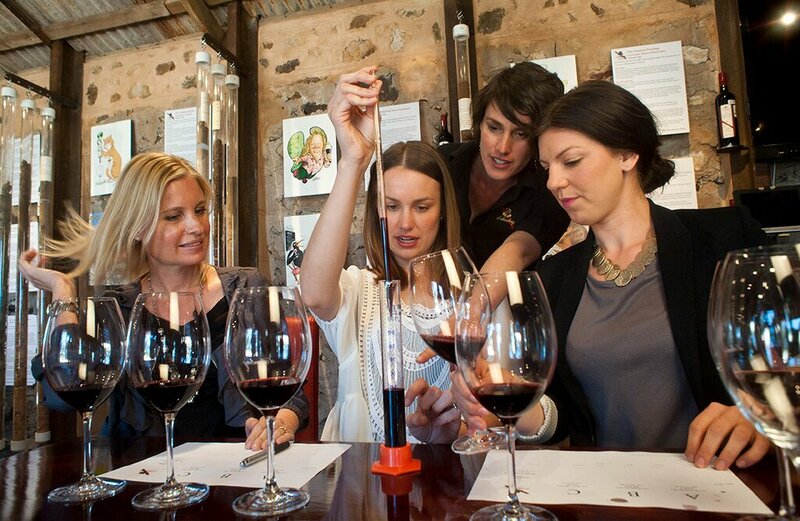 A great way to experience the McLaren Vale Wine Region. Don’t forget their offer in the 2017/18 McLaren Vale Visitor Guide – a complimentary Icon Tasting voucher (offer ends 31 August 2018). The Beresford team take you on a sensory experience across their wine range, showcasing the best of McLaren Vale. Wine experiences start from $10 with some experiences are offered for a limited time and only offered until sold out. Recently featured tastings include the Halliday Tasting Experience and the Artisanal Chocolate and Shiraz Flight. Best to check their website for their latest tasting experience. The recently released Tasting of the Senses Experience at Hugh Hamilton Wines is a must do! Unlock your wine tasting inhibitions and take your eyes, ears, fingers, nose and tastes buds on a sensory journey. Choose between their Pledge, Pivot, and Prestige experiences – memorable experiences that you will be telling your friends about for sure!